We always aim to bring you stories on the trailblazing men and women of color in the world of sports and entertainment, and today we’re excited to continue that mission. Gregory O’Dell, the President and CEO of Events DC, has long contributed to the growing sports and entertainment industries in D.C. In his current role he oversees Events DC’s three lines of business: conventions and meetings, sports and entertainment and special events. As the official convention and sports authority for the District of Columbia, the company owns and/or operates some of the national capital’s most iconic venues, including the Walter E. Washington Convention Center, the Robert F. Kennedy Memorial Stadium and the surrounding Festival Grounds, the non-military functions of the DC Armory, the historic Carnegie Library at Mt. Vernon Square and the Gateway DC events pavilion in the city’s Congress Heights neighborhood. As President and CEO, his primary responsibilities include oversight of the development and promotion of hospitality, athletic, entertainment and cultural activities that generate economic and community benefits for the residents and businesses of Washington D.C., something that he has great success in doing over the last decade. Events DC was created through the merging of two agencies:Â the Washington Convention Center Authority and the D.C. Sports and Entertainment Commission. 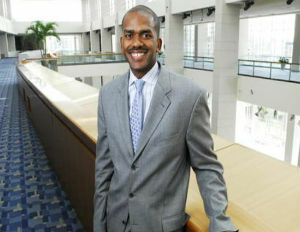 Interestingly enough, the Wofford College graduate has had the unique experience of having led both organization, as prior to the merger he wasÂ chief executive officer and general manager of the Washington Convention Center Authority and before that he wasÂ president and chief executive officer of the D.C. Sports and Entertainment Commission.